ALL THINGS BELLY DANCING - Experience fun, fitness and fantasy! Enter our exotic world. View class schedule, gorgeous costumes, unique gifts, fun trivia, and delicious recipes. BAKLAVAS RECIPE - a favorite Middle Eastern Recipe that you can work off with Belly Dancing! Try this all-time favorite recipe of mine served at many of our Belly Dance parties where students dance to oftentimes live music and we enjoy delicious Mediterranean & Middle Eastern cuisines. Baklavas is delicous and served in small pieces so even your diet-conscious guests will want to try it! It sounds disgusting, but I have had some guests even lick the baking pan they love the Baklava sooooo much and don't want to waste even a crumb of it! Makes 24 - 30 pieces when cut. Baklavas consists of paper-thin phyllo pastry dough placed in a large pan, combined in layers with butter and crushed spiced nuts and then drenched in a wonderful orange flavored syrup after baking. Make sure phyllo is at room temperature. Lay damp dish towel or paper towels over dough to keep from drying out. Melt the butter. Combine syrup ingredients and bring to boil, then simmer syrup on low heat for about 4 minutes. Set it aside to cool until the baklavas is baked. Combine nuts, sugar, cinnamon and nutmeg, then set the filing mix aside. Preheat oven to 350. Place phyllo into buttered pan in layers - completely cover the bottom of the pan with phyllo in a single layer. Then brush phyllo with melted butter and cinnamon/nutmeg mixture. Use a spoon to sprinkle about 1/3 c. filing mixture on first layer of phyllo. Repeat - layering phyllo, then brush with butter mixture, then add filling mixture. You should have about 4 layers with all of the ingredients used, except for the cooled syrup to be used after baking. Bake the baklavas for 45 minutes or until the top is light golden brown. Remove the pan from the oven and let it cool. Next, pour the cooled syrup over the top of the baklavas. Then take a sharp knife and cut through all of the layers in a diamond pattern (per photo). 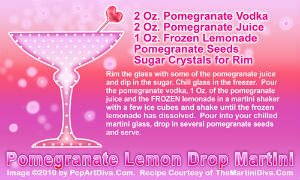 You may serve this up as a dessert or as delicious cocktail hour treat. I called my friend, Terri - The Martini Diva, to see what she would suggest we serve with our Baklava and she suggested her recipe for a Pomegranate Lemon Drop Martini because it has a Middle Eastern flair since Pomegranate is from the Middle East and this is very refreshing. Pomegranate juice mixed with sparkling water would also be refreshing. Why does a Western girl Belly Dance? My name is Atesh - a name given to me by a Turkish friend, Fikri, when he first saw me perform. He said it meant "FIRE." I loved the name and it has come to mean much more to me than my birth name, Diane. Raised by a mother who was a professional ballet dancer, and was part of the famous modern dance revolution emanating from New York, I was greatly influenced by her as she had been by her teacher, Martha Graham. Not only was my mother a performer but also a fine seamstress and costume designer. As a young girl growing up in West Hollywood, my health was not good and she taught me some ballet to help strengthen my body. It always made me feel better to be dancing, and sometimes I would take yards of fabric from her sewing table and wrap myself up and run around the house twirling and moving quickly to avoid running into furniture -- our house was quite small. I started feeling stronger and healthier and attributed it all to dance. It always lifted my spirits too and made me feel good about myself. Not liking the rigidity and discipline of ballet, I started experimenting with other types of dance outside of the home. I took jazz, Hawaiian and tap. Nothing felt as good though as the freedom with dance I had experienced in our home in my younger years. Once I moved to Orange County I started a family and with 2 children under tow, I kept up with dance classes. Soon I discovered Belly Dance and with one class I was hooked. The beauty, spirit, richness, individuality, femininity, sensuality, spirituality, freedom, passion and compassion expressed by this dance was absolutely amazing - I could feel the deep roots embedded in Middle Eastern history and appreciated the historical nature of this dance. I soon became a dedicated Belly Dancer. Now as a Belly Dance teacher, choreographer, and costume designer, I find that not only does this dance continue to feed my spirit and provide me with strength, but it also provides these benefits to my students. The incredible exercise, body acceptance and confidence given along with the ability to accomplish from beginning to advanced movements and techniques is very exciting and rewarding. I take people, from every profession imaginable, and turn them into gorgeous expressionistic Belly Dancers, most with absolutely no previous dance experience! Imagine shimmying your hips to the beat of a dumbek, using every part of your body, perhaps balancing a sword on your head and wrapped in luxurious fabrics of chiffon or silk, laden with coins or beads/jewels. Please view my class schedule to experience the excitement and benefits of Belly Dancing. Classes are suitable for teenagers and adults of all ages. Thank you.... ATESH! My name is Atesh. I have been a teacher of Middle Eastern Dance for over 20 years, working with all levels from beginning to professional. I specialize in sword dancing as well as traditional Egyptian and Arabic dance. I began as a student, then after years of study and travel to Egypt, I became an instructor. I have choreographed many shows, from 1 - 15 dancers along with live bands using 2 - 8 instruments - I design many of the costumes and have been involved with stage set design. I have worked with famous musicians and even danced for a world political leader. I have recorded on a music cd playing finger cymbals. I teach group and private lessons. I have taught many women in group and private classes how to belly dance and some, how to sultanize their lovers. I have danced at many private parties, hotels, conventions, and at the beach, on cruise ships, and private yachts. We have participated in many MECDA shows and I do love performance! All content copyright 2012 by BellyDancerStudio.com. All rights reserved.. Simple theme. Powered by Blogger.